Ooooooh! Aaaaaah! When watching a fireworks display, you often hear these exclamations from the crowd. When you see the bachelor button fireworks in the garden, you just might have the same reaction. Most gardeners and plant lovers know them as bachelor buttons, not to be confused with corn flowers or Centaurea montana, which are also commonly called by the same name. A globe or cylinder-shaped bloom, actually made up of tiny flowers in papery bracts, is really what describes globe amaranths or Gomphrena globosa. Gomphrena fireworks, along with various other Gomphrena, were introduced as Texas Superstars in summer 2012, and all varieties will give you a lot of bang for your buck. 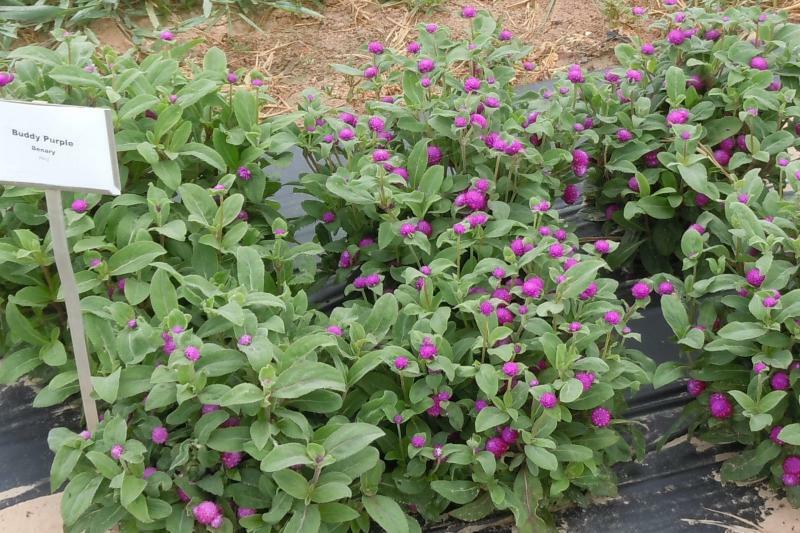 More and more varieties of this old-fashioned flower are being sold at nurseries and garden centers since the Texas Superstar status was awarded. You have to love an annual that performs well all over Texas from early summer into fall. It not only passes rigorous testing as a Texas Superstar, but it also is beautiful. Bill Welch, Texas A&M landscape horticulturist, stated that bachelor buttons were documented in early American gardens. One super thing about globe amaranths is their ability to survive the extremely hot Texas heat. 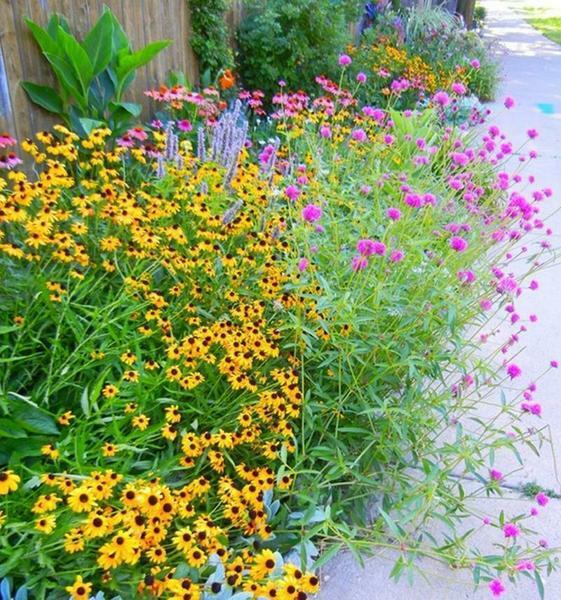 Plant them in early summer, and they will bloom through fall. I visited most of the garden centers and nurseries in Victoria in early April and was told these would be available soon. Keep checking for them. 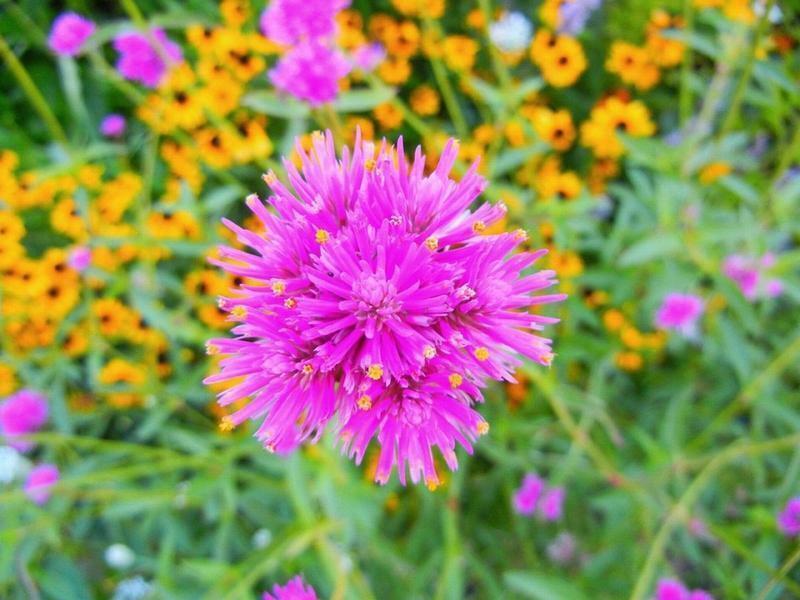 The shape of the bachelor button is round, like a globe, hence the scientific name Gomphrena globosa, or the more common name globe amaranth. They also grow in cylinder shapes and now in a fireworks shape that looks similar to a pincushion. If you look very closely at this composite orb flower, you can see tiny, little yellow stamen poking out of bracts that are commonly purple or white. Since hybridizers have crossed Gomphrena globosa with the Texas Native Gomphrena haageana, you can even find shades of strawberry red to orange. So now you can choose from purple, white, lavender, red, rose, orange and pink bachelor buttons. Fireworks has some crazy, mixed-up shades working with bright, little, yellow flowers shooting out from hot pink colored bracts. There are many ways Gomphrena can be used in the landscape with its many different sizes. They all have a clumping characteristic and will fill in an area about one foot or more wide. Fireworks is one variety that can burst up and grow to 4 feet tall. Some varieties like Gnome stay about 6 inches tall. All around series and audray series are about 2 feet tall. Las Vegas series is intermediate in size - grows to about 11/2 feet. Plant these according to location and desired size and color. Bachelor buttons prefer sunny locations but will perform quite well in partial shade. If planted in deep shade, they become lanky. They are drought- and heat-tolerant. What is really neat about them is that long after the tiny little flowers die, the bracts remain pretty for a long time. But if overwatered, they can suffer from root rot. The gorgeous colors last a long time and attract butterflies in the landscape. As the flower ages, each little orb dries up, and the seeds become very attractive to birds. They truly put out the welcome sign to garden friends. The lasting power of the pom-pom shaped flower makes them great as cut flowers as well. They last so long that they will often get roots while in the vase, making them easy to propagate. The dried heads can be pinched off and crushed and will often reseed. Another benefit is to use the colorful dried flower heads as potpourri. 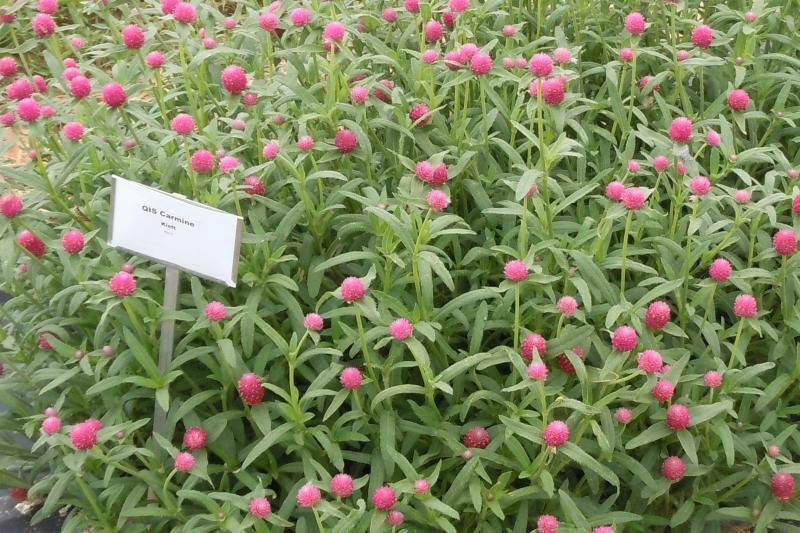 Globe amaranth tea is also known to have some health benefits including anti-aging of the skin. Be sure to research this and/or consult a physician before consuming. Try some of these varieties to get the "oooohs and aaaahs" or wow factor in your flower beds or container gardens. Know that since they are Texas Superstars they will do well for you with little to no investment of effort, time, money, water, fertilizing or pesticides. Pairing the purples with hip hop or any of the wispy, white baby's breath euphorbia sounds super to me. What a bang for your buck. • Audray series - About 2 feet tall; purple, red or bicolor rose.